Update: The RT-AC66U router has been updated with the firmware version 3.0.0.4.208 which installs the AiCloud feature. With the AiCloud feature of the RT-AC66U, users are enabled to access stored files on a home computer through an Internet-connected mobile device like a smartphone or a tablet, regardless of time and place. Apart from a home computer that is most likely a desktop PC, AiCloud with the RT-AC66U router connects with other network-connected devices such as a notebook or a NAS device. If such a device is in sleep mode, AiCloud enables the user to remotely re-activate it. AiCloud does not only allow access to files that are stored on home-based devices, but also those that are saved the cloud-based ASUS WebStorage. Files that can be accessed through AiCloud include documents and multimedia files, enabling users to work and be entertained while on the go. As AiCloud can automatically generate links that lead to stored files, sharing of content with colleagues and friends is made simple. AiCloud is compatible with Android- and iOS-based mobile devices. Below is a video demonstration of AiCloud. Once a dark horse in the networking trade, ASUS has pushed themselves to the forefront with a series of astute efforts, starting with the RT-N16U which marked a nice turning point for the Taiwanese firm two years ago. That said, ASUS' latest super weapon comes in the form of the RT-AC66U, a successor to the RT-N66U (codenamed "Dark Knight") launched earlier this year. 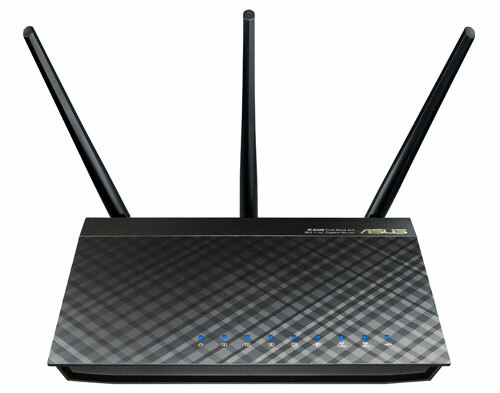 The new dual-band router's fearsome weaponry includes 802.11ac support, which translates into top speeds of 1.3Gbps on the 5GHz spectrum, and 450Mbps on the 2.4GHz band. Trends do indicate that many network hardware makers are undoubtedly taking to the "clouds" in recent times, such as D-Link and Linksys for instance. Now, the RT-AC66U also happens to be the launchpad for AiCloud - a "personal cloud server" service from ASUS which enables users to access data on connected devices via external networks and mobile gizmos. AiCloud is said to be compatible with most operating systems, including Windows, OS X, and Linux. According to ASUS' marketing collateral, other perks of the stylish RT-AC66U include a 30-second setup, six guest SSIDs (three on 5GHz, and another three on 2.4GHz), and fancy cooling solution like the "high-density aluminum fins" built into the unit. Enthusiasts might want to know that the router is powered by a similar main chipset used by the RT-N66U, or more specifically, the Broadcom BCM4706 with a clock speed of 600MHz. On the wireless side of things, the device carries the Broadcom BCM4360 and BCM4331. Looking back, the slightly older RT-N66U did produce decent throughputs on both bands, although it somehow failed to outshine the RT-N56U by comparison. On the note, we're hoping the RT-AC66U will be capable of breaking the speed barriers established by the 802.11n dual-band routers, and hopefully leave the RT-N56U and RT-N66U behind in its wake.